Restoring the U.S. Capitol Dome is a massive project. It's exciting to uncover the artistry of a long-gone era and to see elements of the Dome that have not been seen for decades. More than 1,300 cracks in the nearly nine million pound cast iron Dome are being repaired by experts working day and night on the Dome scaffolding. But the Dome also has many ornamental and functional cast iron parts that are so broken and badly damaged that they cannot be repaired on site. There are scores of decorative ornaments on the Dome – such as, scrolls, flowers, acorn finials, acorn pendants, rosettes, acanthus leaves. They were created in the 1850s and 60s and some of them are missing or damaged beyond repair. A foundry in Salt Lake City, Utah, is recasting these pieces, and last week I had an opportunity see firsthand how the work is done. We select a piece of a cast iron feature that is in good condition, so it can be used to develop a pattern to cast a replacement. We remove these pieces from the Dome and ship them to the foundry where they can be used to create patterns for sand casting. The pattern is placed in sand with a chemical binder to create a mold. The sand mold cures in a matter of minutes and becomes as hard as sand stone. Molten cast iron heated to more than 2,500 degrees is poured into the mold. This is something that is quite dramatic to witness! Once the mold is cool, the hardened sand mold is chipped away and a new ornament is revealed. The new ornament is shipped back to the U.S. Capitol and installed on the Dome. Attention to detail and historical preservation are paramount. 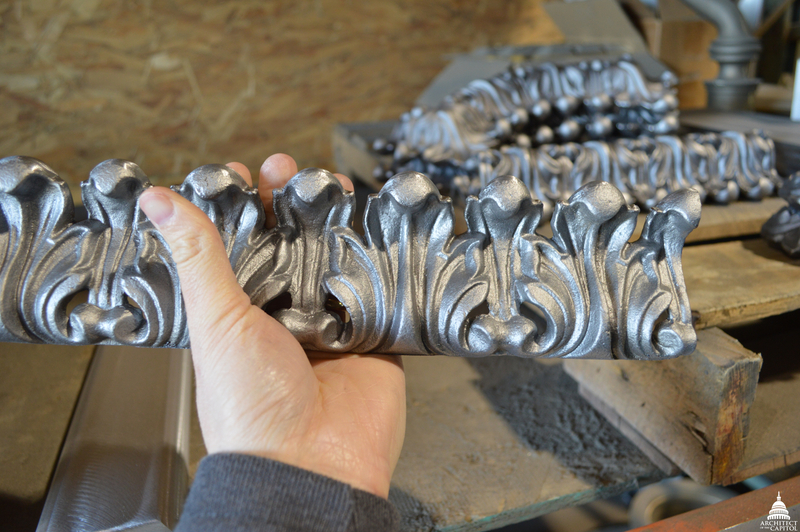 The careful process even allows us to reclaim some of the original cast iron, saving the historic fabric and reusing it in the ornamentation. What I find most fascinating is the amount of detail that went into crafting the ornaments. It is incredible to see the intricacy and to realize that these decorations were created at the time of the Civil War. There are little lines and indentations the size of your pinky fingernail that cannot be seen from the ground and that have been obscured under a dozen layers of paint. It is astonishing to know that we are seeing these details for the first time since the last restoration in the 1960s. 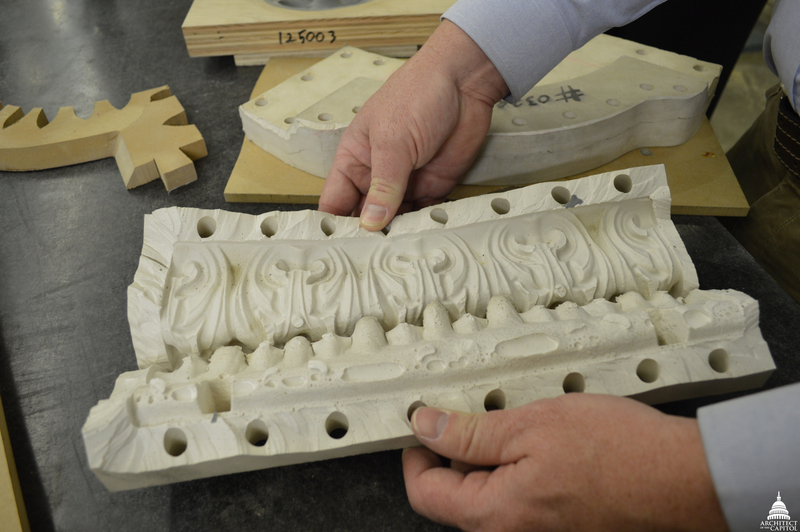 It's an honor to be preserving American history and know that we are making it possible for the public to appreciate the skilled craftsmanship and artistry that are a part of the U.S. Capitol. Learn more about the U.S. Capitol Dome Restoration Project at aoc.gov/dome. 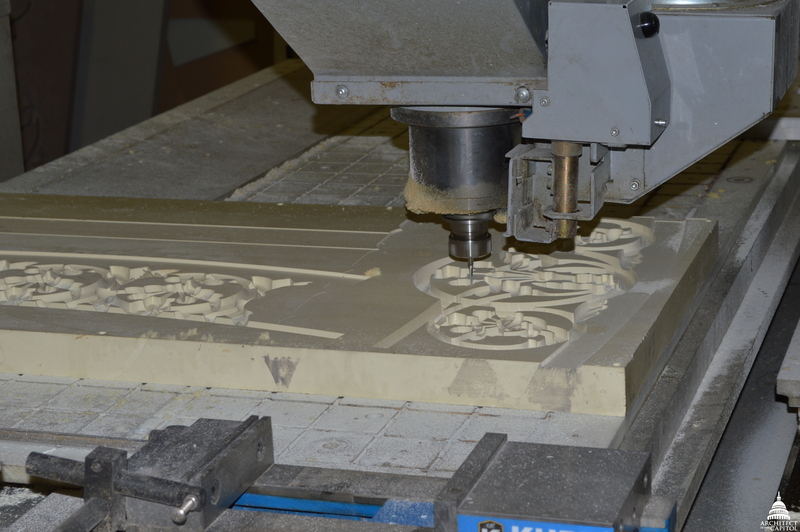 Wood toolings are made using 3D scanners and automated cutters. A wood tool is made of an existing rosette ornament. 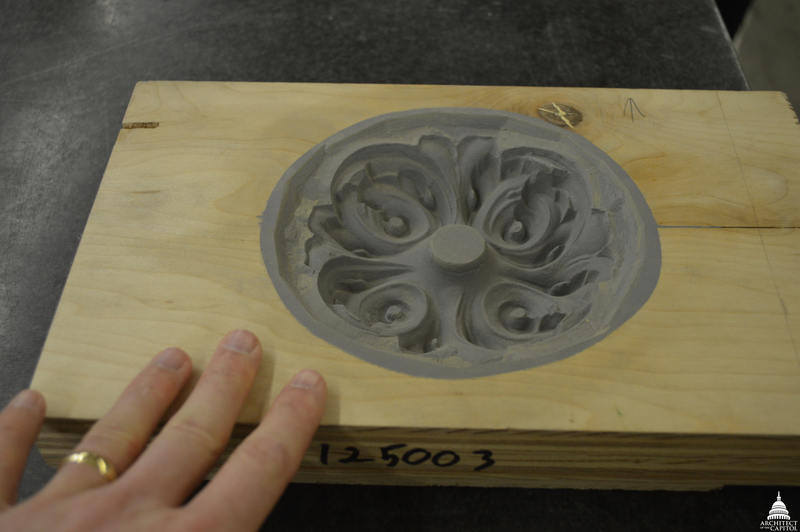 This negative will be used to create a pattern that will be used to make an impression in the sand molds for casting. A tool made of rubber is made of an existing lambs tongue ornament. This negative will be used to create a pattern that will be used to make an impression in the sand molds for casting. A newly cast lambs tongue ornament. Wondered why all the ironworks we being erected on the Capital Building. Fascinated ! Hope more photos are coming. Extremely interesting process. As a 40 year experienced Jeweler and Goldsmith it is amazing that this is the same proceedure I use to duplicate and restore fine heirloom jewelry pieces,only on a much smaller scale. So glad to find out why all of the metal was covering the Capitol. I had the pleasure of vacationing in D.C in 1996. Love it dearly Great job everyone working so hard to restore the dome. Good treasures last forever and its worth keeping for years to come. it would be wonderful if an update, status of the progress would be put on the big news shows. Hey Joe-Your Dad would have been so proud!Great Job!I'm following all the progress now that UB gave me a computer! "Mo"
I'm very much impressed and appreciate keeping the dome intact. Let's see it ! Hope PBS is documenting this project! Beats political new!! Was wondering what was going on with all the scaffolding on the dome. Now I know...thanks for the info! Hope the workers keep safe and the project is completed successfully and on time. That is so interesting that they are able to make molds for the metal and so they can come out with these beautiful designs in metal. I know they could do this, but the molds they show here seem really small and I would think that the wood would cause problems and end up burning which would in turn ruin the mold. We have come a long way from just being able to make metal to having artistic carvings molded onto them. I have wondered for months what in the world was going on seeing it in the background of FOX's news shows. Kept forgetting to inquire, and now, I finally know!! Thanks for enlightening us. I follow a page on Instagram where they talk about metal working. It's amazing to see what they make and how they make it. I can't wait to learn more about this and how to do it. Nobody has yet to mention in 1850 - 1860 these were all done by hand. Etched poured and made to put on Capitol building now machines can mimic that craftmanship think of the people who did the original. One at a time. These is not an attempt to diminish the work of the craftman of today, But merely a praise for original craftmans. I love the craftsmanship of you iron work! It is amazing what an art it is to shape iron into arrangements. I had no idea wood toolings are created by the usage of 3D scanners. Thank you for sharing!